So today on the blog, I have something a little different to my norm... It's an exciting guest feature from Guides for Brides! I have been featured on their blog before with one of my real weddings, so of course it made sense for them to do a little feature here to share - because sharing is caring in this industry! As many of you know, I travel across the UK and the world, and these are a few venues I would love to shoot in! So, without further ado, here is what the lovely Helena Jones has written for all of you lovely couples looking for the perfect venue! Want a chic, rustic barn wedding but struggling to find the perfect venue? Guides for Brides have picked out some of their favourites from across the country to get you inspired! The beautiful Dodford Manor in Northamptonshire beams the rustic beauty of a barn with up-to-date details that their couples adore, including atmospheric lighting both inside and out, and clever climate control to keep your guests cool or cozy during all seasons. London brides who are looking for a rustic barn wedding will fall in love with the gorgeous Gaynes Park in Essex, as it’s just over an hour’s drive from central London. This venue works in every season, but especially for spring and summer weddings as there are plenty of options for gorgeous outdoor ceremonies. You’re in safe hands with the fabulous team at Winters Barn near Canterbury, as they’re a Guides for Brides 2018 Customer Service Awards Winner! 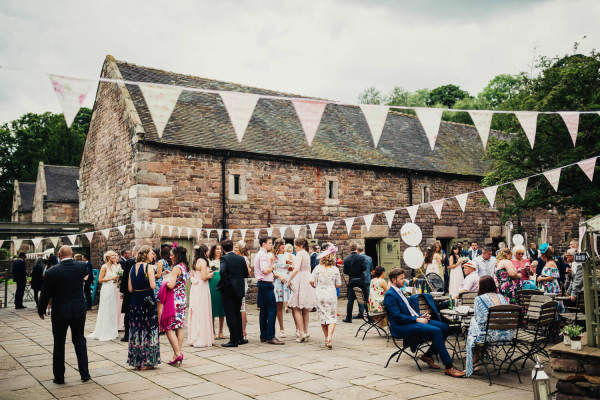 This venues is fabulous both inside and out, thanks to the pretty courtyard garden and gorgeous wedding arch, and if it’s a historical look you’re after, the original wooden features at Winters Barn date back to 1600! Thanks to the peaceful lake, fairy light-covered verandah and surrounding countryside, Sandhole Oak Barn has one of the prettiest wedding backdrops on this list! If you want to tie the knot outside, then you can get married under the Clock Tower overlooking the water, or you can get married in the oak-beamed ceremony barn with up to 140 of your nearest and dearest. The medieval barns at Caswell House in the Cotswolds are one of the most picturesque places we can think of to make it official. The grounds are something special too, thanks to the ancient orchard, moat with a bridge (perfect for those wedding photographs), and walled courtyard garden filled with traditional English blooms. You can’t get more romantic or secluded then Trevenna Barns in Cornwall. This cluster of authentic barns is set in a massive 142 acres of countryside, in an Area of Outstanding Natural Beauty. You’ll be able to appreciate the view from the light and airy Threshing Barn or the Garden Venue, or take full advantage of the sunshine by marrying under the wooden Arbour. This charming barn in rural Oxfordshire is perfectly placed for brides out of London and Oxford, and is packed with gorgeous original features and pretty final touches. For spring or summer brides, the large lawn at Laines Barn is ideal for outdoor ceremonies and garden games, and the festoon lit barn and wooden bar are beautifully warm and cozy for the colder months. Brendenbury Court is a stunning collection of barns nestled in the countryside of the West Midlands, and currently undergoing a careful restoration process for a historic meets modern vibe. You’ll find yourself celebrating your love in a charming 1920s Orangery and dining in a glass-walled Oak Barn, taking in the incredible countryside views. Since it opened as an exclusive-use wedding venue in 2016, Blackwell Grange has been one of the country’s best up and coming barn venues and we’re not surprised. They have a fabulous planning team behind them, including award-winning caterers Galloping Gourmet. This unique, quirky barn setting and their creative team are a great option for couples who want something a little bit different for their big day. There are plenty of ceremony options at the Tythe Barn, from the village church at the end of the gardens to the wisteria-clad pergola or one of the two gorgeous barns. We all know the Cotswolds is brimming with wildlife and beautiful rolling hills – the perfect setting for a countryside barn wedding. Traditionally a grain store dating back to 1702, Oxleaze Barn is situated on an organic Cotswold farm and styled and restored to reflect the Gloucestershire countryside surrounding it. The Mill Barns is a stunning waterfront wedding venue that has three interlinking barns with a sleek contemporary look – perfect if you’re after a less rustic feel. There’s a huge space for indoor ceremonies, as well as the option for an outdoor wedding on The Terrace overlooking the waters of the Mill Pond. A gorgeous pair of 17th century grade II listed barns, the mesmerising setting amongst the natural stone and original timber beams makes The Ashes Barns the most gorgeous wedding location, starting from the moment you begin getting ready in their private dressing room, through your wedding ceremony and onto the evening celebrations. So, I hope that's given you all some ideas for your own weddings! Thank you so much Helena for sending me your guest post, and don't forget to get in touch if you're still looking for your wedding photographer!